With a history dating back to Roman times, today the Vaucluse is a patchwork of vineyards punctuated by olive groves and watched over by the silent majesty of Mt Ventoux - a Mecca for cyclists who come to challenge themselves in emulation of their Tour de France heroes. Our gentle 6 night cycling holiday, however, offers you a much more relaxed way to take in this fabulous region, one of the most fertile plains in southern France and home to such wine appellations as Gigondas, Vacqueyras and, further afield, Chateauneuf-du-Pape. It's also home to the Ventoux appellation which, although not as well-known as its cousins from the Rhone Valley, offers some fantastic wines at equally impressive prices. West of the mountain the skyline is dominated by the silhouette of the Dentelles de Montmirail (so named after a type of lace and not, as some would have it, their tooth-like appearance) whose Jurassic-era limestone is instrumental in growing the area's most famous produce. 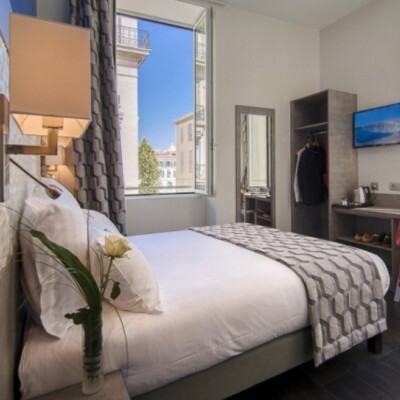 We've hand-picked a great mix of hotels for you, most of which have a swimming pool and also offering fine Provencal cuisine and cellars full of local wine. 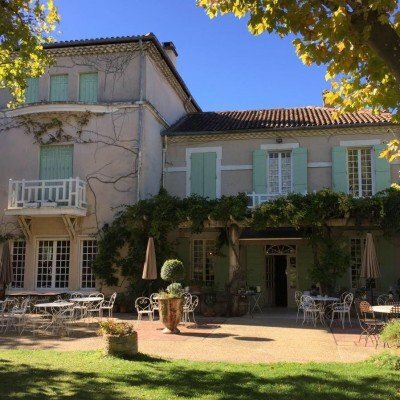 In Pernes-les-Fontaines you stay in a C19 stately manor house surrounded by landscaped gardens; in Montmirail your hotel is a C17 villa tucked between vineyards and olive groves; then in Mazan you stay in a C18 chateau, the former home of the Marquis de Sade. After checking into the Hotel Bristol, you have free time to discover all that Avignon has to offer and choose a restaurant for dinner (pay locally). Today you are spoiled for choice. You can cycle through the Vacqueyras vineyards to the village of Gigondas, famous for its ruby-red wine, where you'll find masses of tasting opportunities (you can also visit Gigondas on foot by taking a leisurely stroll through the stunning Dentelles de Montmirail). Alternatively you could take a taxi to explore Orange with its famous UNESCO Roman amphitheatre and cathedral or to Chateauneuf du Pape for the world-famous vineyards there. However, if that all sounds too much you can simply relax by the pool and take in the wonderful Provencal ambiance. Today you leave Les Dentelles behind as you head for the village of Beaumes-de-Venise with its muscat wines and olive oil museum. Then it's a gentle ride along quiet lanes, past olive groves at the foot of Mt Ventoux, to the ancient, fortified village of Caromb. Home to an impressive church, a C16 watchtower and 14 fountains, it makes a nice option for lunch. With Mt Ventoux at your back now, head south through the vineyards to the mediaeval village of Mazan with its church wall made up of more than 60 Roman sarcophagi. 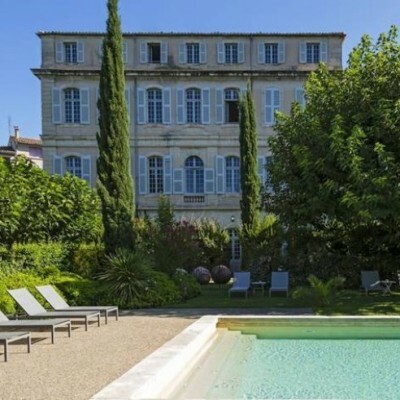 Your home for the next two nights is the country chic C18 Chateau de Mazan. After breakfast take a ride to the lively village of Bedoin, named for the C8 Bedouins who settled there and home to the imposing church of Saint-Antonin, with its unique Spanish style - so different from any other in Provence. Bedoin is also the gateway to Mt Ventoux for more hardy cyclists seeking a challenge! From there follow established cycle routes to the Chateau Pesquie, which offers everything from a stroll in the vines, to a guided cellar tour, to a tasting, to a full picnic lunch in the gardens. Then it's back to Mazan, either to explore the village or relax by the pool before dinner. This morning follow empty lanes and vineyard tracks to Malemort-du-Comtat before coming to the foot of the hill on which the wonderful mediaeval village of Venasque sits perched, still surrounded by the remains of its ramparts and three Saracen towers. Listed as one of the 'Most Beautiful Villages of France', there is also a lovely C11 baptistery right in the heart of the village. Heading back down leads you to the popular village of St-Didier with its great variety of lunch options. It's then a fairly short distance to the old town of Pernes-les- Fontaines where you should have time to explore before heading back to your hotel for a swim in the pool before dinner. Just a short distance from both Vacqueyras and Gigondas is the Hotel Montmirail, a handsome C19 villa tucked away between vines and olive trees at the foot of the lace like peaks of the Dentelles de Montmirail. The hotel features a fine-dining restaurant and a relaxed bar, as well as a swimming pool and an expansive patio in the garden. Standard rooms feature free Wi-Fi, satellite TV and minibar, while upgraded rooms are decorated in a French country style and have views of the garden and pool. Please note that there are no twin rooms at this hotel. Room upgrades: Comfort Room or Superior Room. The Comfort room is slightly larger and offers views over the hills. The Superior room is larger still and offers a veiw of the garden and pool. 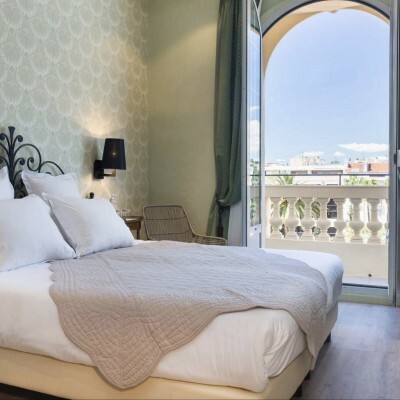 This wonderful, airy hotel is housed in a C18 mansion in the historic centre of the village of Mazan. The country-chic rooms have free WiFi and minibars and upgraded rooms come with everything from whirlpool tubs to private gardens and terraces. An elegant restaurant offers period features and a garden terrace, and there's also a bar with retro styling. Other amenities include landscaped gardens with an outdoor pool. Room upgrades: Superior Room with Bath, Superior Room with Hammam, Garden room with shower	or Garden room with bath/Junior suite. Superior room with bath - Room with twin beds or double bed, bathroom with bathtub, located in the chateau or in 'La Maison'. Superior Hammam room - Room with garden view, twin beds or queen size bed, bathroom with Steam shower cabin. Rooms are located in the chateau or in 'La Maison'. Garden room with shower - Room with private terrace leading to the garden, twin beds or queen size bed, bathroom with shower. Garden room with Bath - Large room with private terrace leading to the garden, twin beds or king size bed, bathroom with bathtub. Junior suite - Large room with garden view, twin beds or king size bed, bathroom with bathtub or Jacuzzi bathtub. Suite - Large room with garden view, twin beds or king size bed, private lounge, bathroom with bathtub and shower. 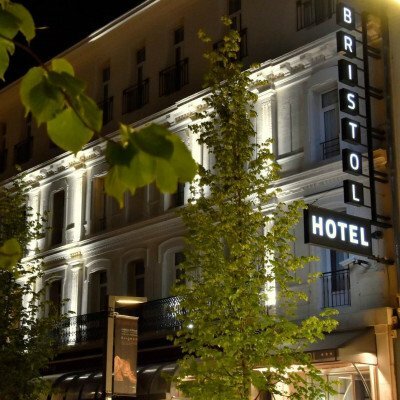 On day 1 customers should make their own way from Avignon TGV to Hotel Bristol by taxi approx 18€ before 7pm and 21€ after 7pm and Sundays, approx 4km. Transfer on day 2 is included from Hotel Bristol at 16:30, and back to Avignon TGV train station at 11:50. Road bikes (Carbone Look 765) are available at a supplement of £152 per person. As these are available on a first come first served basis, we recommend early booking to avoid disappointment.